The future left side of the Padres infield was on full display Friday night, and it's looking more and more like it should be beyond the beta phase. Manny Machado opened the scoring with an RBI double in the first inning and Fernando Tatis Jr. collected a pair of hits, two stolen bases and two runs scored in a 6-5 Cactus League loss to the Rockies at Salt River Fields at Talking Stick in Scottsdale, Arizona. 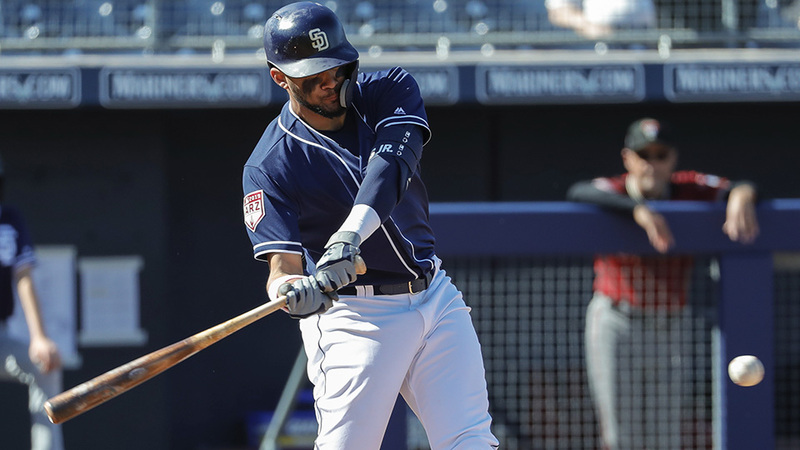 Tatis, MLB.com's No. 2 overall prospect, grounded a 1-1 changeup from Rockies No. 13 prospect Justin Lawrence to third and legged out an infield single with two outs in the opening frame. The 20-year-old promtly stole second and third and came home on a single up the middle by Austin Hedges. Two innings later, the top Padres prospect beat out a grounder to first on a 1-2 heater from right-hander Bryan Shaw with two outs. He again wasn't on the basepaths long as he scored all the way from first on Hedges' single to center. Third-ranked Rockies prospect Garrett Hampson capped a five-run, ninth-inning rally with a walk-off three-run homer with two outs. Niko Decolati (No. 23) entered as a pinch-runner in the sixth and scored a run, while No. 27 Roberto Ramos started the comeback with a two-run single. Righty Jesus Tinoco (No. 20) allowed a hit and two walks over two innings of scoreless relief for Colorado. Pete Alonso, MLB.com's No. 51 overall prospect, continued his stellar spring for the Mets with a pair of hits, an RBI and a run scored to bump his slash line to .356/.387/.627 with four homers, four doubles and 10 RBIs in 62 plate appearances at big league camp. Called up from Minor League camp, Mets No. 3 prospect Ronny Mauricio -- a 17-year-old shortstop -- went 1-for-3 with an RBI and a strikeout.